Plant-parasitic nematodes (PPN) are microscopic roundworms that attack plant roots and other below-ground parts, but also stems and leaves. They are among the most widespread pests with over 4 000 species of plant-parasitic nematodes reported worldwide. In South Africa, about 455 species have been reported. However, Meloidogyne spp. (root-knot nematodes) is the economically most important pest parasitising most crops followed by Pratylenchus spp. (lesion nematodes). Although information on their economic impact remains less than comprehensive, collectively they pose an important constraint on the delivery of local food security particularly for crops produced in subsistence farming areas. Weeds on the other hand, do not only compete with crops for space, light and nutrients (Photo 1), but may act as hosts of other pests, thus, posing economic yield losses on crop production. Crop and quality or yield losses due to plant-parasitic nematode parasitism are usually more serious in subsistence farming communities than in first world countries. This is particularly due to knowledge gaps as well as the limited availability of infrastructure and finances existing in the subsistence agricultural sector. 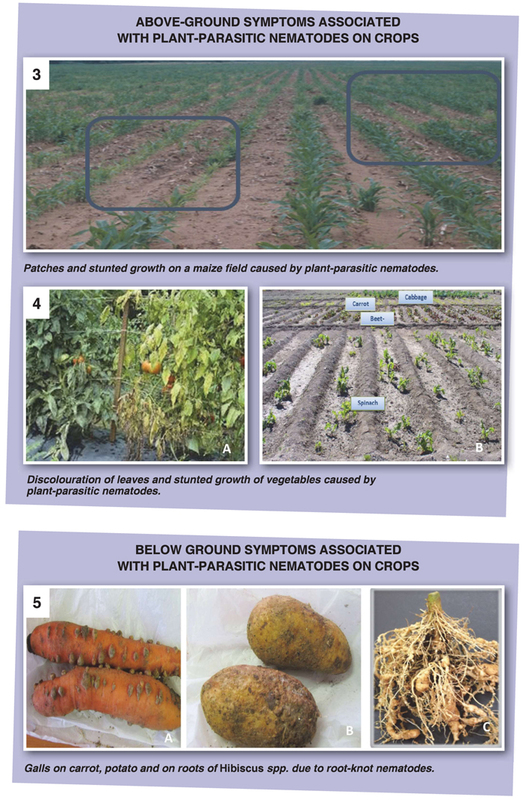 Damage caused by plant-parasitic nematodes often goes unnoticed or are attributed to other growth limiting factors, due to lack or absence of above-ground symptoms and ignorance by producers. The nematode problem is furthermore aggravated in the developing agricultural sector due to limited and marginal land available to grow food crops and the traditional use of cultivars that are susceptible to PPN in multiple cropping and intercropping systems (Photo 2a - b). It is crucial to identify the effective and compatible integrated pest management strategies that will address both weed and nematode management collectively, in order to prevent population build-ups of target nematode pests. Weeds generally reduce the efficacy of crop rotation aimed at nematode management. In addition, some weeds that serve as a supplementary food source, may not be intentionally removed by producers, but rather be semi-cultivated along with a given staple food crop. This inevitably leads to a build-up of PPN populations and eventually the main crop suffers damage while producers are unaware of the situation. Timely weeding of food plots is essential to limit population PPN build-up, since weeds may serve as hosts and support the development and reproduction of such pests. Helps retain soil moisture and adds to the availability of plant nutrients. Increased water and nutrient uptake by plants help to withstand nematode attack. Manures, peats or compost amendments will also increase the level of microbes in the soil and thus favour the build-up of other beneficial micro-organisms that feed on all soil microbes, including non-parasitic nematodes. However, it is essential to ensure that compost used should not include partially decomposed roots/tubers that are infected with PPN or other soil-borne pathogens. Previous research showed that decayed kraal manure treatments reduced root-knot nematode numbers between 41% and 71% in tomato trials and between 49% and 99% in maize trials planted in resource-poor areas. Effective for small plots and entails covering the soil with transparent plastic during the summer season when high day temperatures are experienced. This strategy was also successfully applied in ARC trials and reduced general root-knot nematodes substantially. Plants that are related usually are susceptible to same pests and diseases and should not be planted close to each other or follow each other in a rotation cycle. Root and tuber crops in particular should not be planted in the same area of the garden in succeeding years because they are highly susceptible to PPN and other pests and diseases. Host plant resistance is another option for the prevention of general root-knot nematodes population build-ups in cropping systems. This method is a good management choice because it involves minimal effort and expense. However, resistant crop varieties are not available for all grain and vegetable crops. Use of green manure and or cover crops such as Vetiver grass and the Brassica cultivar Nemat reduced general root-knot nematode populations in both greenhouse and field trials. Vetiver grass can also add value for a producer where livestock forms an integral part of the farming system. Physical destruction of roots/other plant parts: Destroy roots/other plant parts as soon as the plants are no longer growing in the garden. Plant-parasitic nematodes continue to feed and reproduce on root fragments/other plant parts in the soil and build up to damaging levels for susceptible, follow-up crops. Article submitted by Nancy Ntidi, ARC-Grain Crops, Potchefstroom, Akhona Mbatyoti, ARC-Tropical and Subtropical Crops, Mbombela and Driekie Fourie, Unit for Environmental Sciences and Management, North-West University, Potchefstroom. For more information, send an email to ntidin@arc.agric.za.